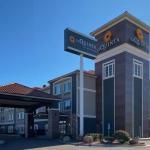 Free Wi-Fi a daily complimentary breakfast and a convenient location along the famous Route 66 attract guests to the non-smoking La Quinta Inn & Suites Gallup. La Quinta's 67 non-smoking rooms have cable TVs free Wi-Fi microwaves refrigerators coffeemakers and hairdryers. Mornings begin with a free breakfast of waffles hot and cold cereals and beverages. Guests can make a splash in the indoor swimming pool and stay in shape at the fitness room. Meeting rooms are available for business travelers. The laundry room lets guests pack light. Pets are allowed. Parking is free. Just off I-40 along historic Route 66 La Quinta Inn is two miles from Red Rock State Park and six miles from University of New Mexico-Gallup. Fire Rock Navajo Casino is two miles away. Several shops and restaurants are within a five-minute drive. Gallup Municipal Airport is less than seven miles from the hotel. It's 139 miles to Albuquerque International Sunport. Dogs up to 25 pounds are allowed. There are no additional pet fees. There is a pet waiver to sign at check in. Dogs may not be left unattended, and they must be crated or removed for housekeeping. Dogs must be leashed and cleaned up after.